Soothing and attractive, the 11 story, 189 room Hotel Monaco Seattle celebrates the romance of travel with a delightful mix of style and surprise. The magnificent decor of the hotel reveals itself the moment guest's step through the door. 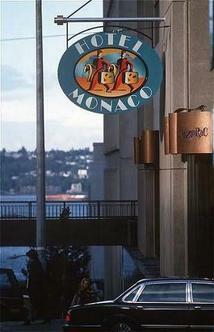 The Monaco immerses business travelers and pleasure seekers alike with the outstanding service of a world-class hotel. Located within walking distance to the waterfront and Pike Place Market, Washington State Convention & Trade Center, shops and the Seattle Art Museum. Guests can linger in front of the fireplace in the 2 story lobby during the "Hour of Indulgence" Hosted Evening Wine Reception. Pets are welcome or guests can request a pet goldfish to keep them company during their stay. Rooms are spacious and comfortably decorated in a vibrant palette of reds, yellows and blues. An early departure fee in an amount up to one night's room and tax may apply. Our environmental program, Kimpton Hotels EarthCare, supports a sustainable world by using non-intrusive, high quality, eco-friendly products and services, including In-Room recycling bins, non-toxic cleaners, organic honor bar items and water/energy efficient measures. Kimpton Hotels EarthCare products and practices are based on California Environmental Protection Agency (EPA) Green Lodging Guidelines.